When I think of pie, I think of my Grandmother Helen. When I was a little girl living in Seattle, our family would trek out to Tacoma for Sunday dinners at my grandparents’ house. It was a special place to visit as a child because it was such a beautiful home, right on Gravelly Lake, with large spans of green grass, beautiful gardens and wonderful aromas of delicious food. I remember her roasted chicken and mashed potatoes quite well...and, of course, her apple pie, which she made from Gravenstein apples, harvested nearby. Sadly, I don’t have her recipe of that pie, but I did develop a fondness and an affinity for making pie and it’s one of my most favorite desserts to throw together to finish a meal, at any time of year. 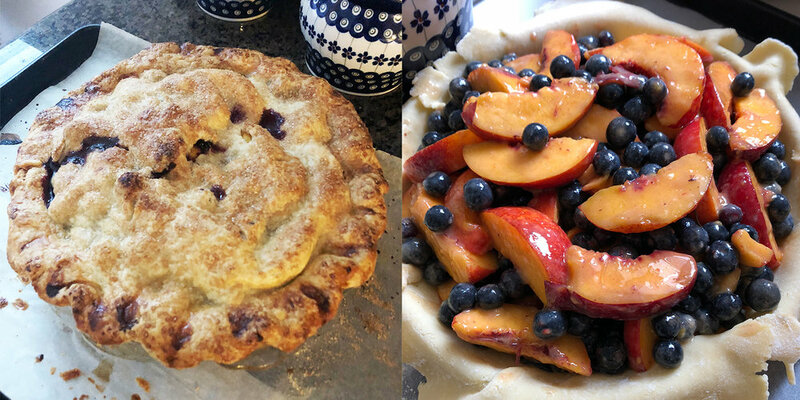 My most favorite recipe for pie dough is one adapted from the Tartine cookbook, the filling through trial and error and the help of Ben and Karen Barker’s amazing cookbook, Not Afraid of Flavor. This is a great recipe to make right now, while the abundance of berries and stone fruit is at its peak. Note: I like to cut up the butter and place it in the freezer while I gather the other ingredients. Also, you can make the dough ahead of time and keep it in the freezer, thawing it the night before you want to make the pie. Place the flour, salt and sugar into the work bowl of the processor. Scatter the cold butter chunks on top of the flour mixture and pulse the dough 10-12 times. You want the butter pieces to still be be visible and about the size of peas. Gradually add some of the water, not all, and pulse some more, about 3-4 long pulses. Add more water, if needed and pulse once more until the dough comes together. Sometimes I open up the top and squeeze some of the dough together...if it just sticks together, it’s ready. Carefully dump the dough out onto a lightly floured countertop. Form the dough into two similar sized disks. Wrap the two disks in plastic wrap. I often use the plastic wrap to help me form the disks, especially if the dough is crumbly. You’ll want to let the dough rest in the refrigerator for a couple of hours or overnight. It should be very cold when you start to roll it out. Combine all of the filling ingredients and set aside. Mix the egg and the water together with a fork and set aside. Roll out one of the dough disks about ¼ inch thick on a well floured kitchen countertop. I use a rolling pin and roll from the center outward, moving my dough often so it doesn’t stick to the countertop. Once it’s thin enough, I usually fold the dough in half and quickly move it to a 9-inch glass pie plate. Trim any excess overhang. I generally then place the pie plate on a parchment lined sheet pan to catch any of the juices that may overflow. Place the fruit mixture into the crust, mounding it slightly in the center. Roll the top crust out quickly, as above, and lay atop the filling. Again trim any extreme excess then fold the edges of the top crust under the pie and press well to seal. Crimp the edges any way you desire (check out You Tube for help here). Brush the crust well with the egg wash, cut a steam vent, I usually grab kitchen shears and snip a cross in the center of the pie. Sprinkle the whole pie with Turbinado sugar, if you have it, or regular granulated works too. Then pop the pie into the oven. Bake the pie for about 30 minutes at 400-degrees, then reduce the heat to 375-degrees for another 20-25 minutes or until the crust is golden brown and the juices are bubbling. Serve with vanilla ice cream and eat while the pie is still warm, if you can!